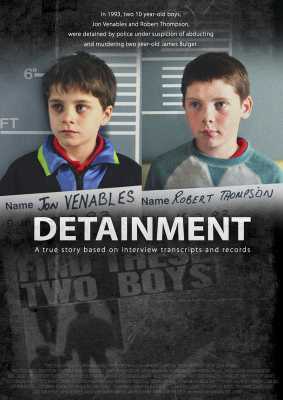 Writer-Director Vincent Lambe’s important film is based on the true story of James Bulger, a two-year-old boy who was abducted in the UK in the early 90’s and found brutally murdered two days later. But the most shocking aspect of the case was that the main suspects were just children themselves – two ten-year-old boys. Based on their interview transcripts, the film dramatizes the police interviews which took place at the time. This film has been shortlisted for a 2019 Academy Award. Detainment stars Will O’Connell (Game of Thrones), David Ryan (Vikings), Tara Breathnach (The Tudors), Morgan C. Jones (Legend of Cambria), Brian Fortune (Game of Thrones), Kathy Monahan (Vikings), and introduces two exceptional young actors, Ely Solan and Leon Hughes, who have been critically acclaimed for their astonishing performances. As I sat and watched this film, I was horrified by what I saw. I was horrified, at first, by the way the police were questioning the boys, James and Robert and the way the boys were being treated as if they were adults. The horror that they went through on both sides: Doing the acts of violence that they did and watching them go through the interrogation bothered me deep down. Why did they treat these children so harshly? Yes, I know you must get to the truth, but my God, they are only children, right? Some would say that and others, like the parents of baby James, would say, otherwise. These two 10-year old’s were brutal, beasts, malicious, murderous and whatever other colorful metaphor you can think of, because I will not write that here. Although this story is based on truth, no child should ever go through what these boys did and endure what adults go through for the same crime. Yes, I know, what about baby James? An innocent 2-year-old ripped from his family just because these boys treated him like a toy and threw him away when they were done. God, it makes me sick. I realize Vincent Lambe wanted to make this movie and tell the story of what happened but in doing so, he makes it difficult for some to watch and endure. It was really hard for me and I was rolling my mouse over the timeline hoping that I wasn’t going to see something so disturbing that I could no longer watch. I was scared; literally scared! It disturbed me and made me wonder, how can two 10-year-old children be as cold-hearted and ruthless as a 20, 30, 40, 50-year-old or even older adult? Where does that thought process come from? The beginning of the film shows the children stealing candy, bothering people, stealing toys then destroying them, and cutting up at the mall. Things that children “shouldn’t” do and should be in trouble for acting out. A foreshadow to what was to come, was a toy plastic soldier. Jon had stolen it from a toy store and was playing with it on a railing above an escalator. He then nonchalantly drops it from above down to the descending steps. It breaks in half and is left there, forgotten. This is where the story foreshadows what the children would do to James Patrick Bulger, an innocent 2-year-old child. Why? This was the single word that was seen on a condolence card with hundreds of flowers, cards and candles. Why? I have to ask myself, what made these two children act out in the way they did? Was it; bad parenting? Were they forgotten? Did their parents not care about them so they in-turn didn’t care about James? Why? So many questions. One thing I noticed was that Robert was more belligerent that Jon. Jon denied and denied then acquiesced into telling the truth. Robert challenged his interrogators constantly. In the end, both boys were found guilty of being the youngest convicted murderers in the 20th century. The performances by the adult actors, Will O’Connell (Game of Thrones), David Ryan (Vikings), Tara Breathnach (The Tudors), Morgan C. Jones (Legend of Cambria), Brian Fortune (Game of Thrones), and Kathy Monahan (Vikings) was exceptional. I know it had to be incredibly difficult for them as I know they must be parents and grandparents themselves as I am. Vincent Lambe, although telling this story was necessary, he felt, has brought to the forefront our responsibility as parents. That responsibility lands squarely on our shoulders and we must do everything we can to protect and teach our children right from wrong and truth from lies. Yes, there may have been other circumstances that we will never know about Jon and Robert. Not even the jury was told everything as it was too disturbing. This was a hard review to write, possibly, the hardest since starting my journalistic career.